This article is about the circulating £2 coins first issued 1998 (dated 1997) and the commemorative coins issued from 1986 to 1996. For earlier two pound coins, see Two pounds (British gold coin). The coin was introduced on 15 June 1998 (coins minted 1997) after a review of the United Kingdom's coinage decided that a general-circulation £2 coin was needed. The new bi-metallic coin design replaced a series of commemorative, uni-metallic coins which were issued between 1986 and 1996 to celebrate special occasions. Although legal tender, these coins have never been common in everyday circulation. As of March 2014 there were an estimated 417 million £2 coins in circulation with an estimated face value of £834 million. The original reverse of the coin, designed by Bruce Rushin, is an abstract design symbolising the history of technological achievement, accompanied by the words TWO POUNDS above, and the year of minting below. This was the first bi-metallic coin to be produced for circulation in Britain since the tin farthing with a copper plug produced in 1692, and is the highest denomination coin in common circulation in the UK. The coin consists of an outer yellow metal nickel-brass ring made from 76% copper, 20% zinc, and 4% nickel, and an inner steel-coloured cupro-nickel disc made from 75% copper, 25% nickel. The coin weighs 12 grams (0.42 oz) and is 2.84 centimetres (1.12 in) in diameter. The design itself was first tried out in 1994 when the Royal Mint produced a short run of demonstration pieces to the new bi-metal standard. These pieces were not for circulation and were simply intended to test the manufacturing process. The coin was technically similar to the version which eventually entered circulation with the Maklouf effigy of Queen Elizabeth II on the obverse and the image of a sailing ship similar to that previously used on the reverse of the pre-decimal halfpenny piece. 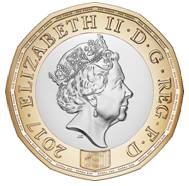 The inscription on the reverse read ROYAL MINT TRIAL 1994 with an edge inscription based on the one pound coin which read DECUS ET TUTAMEN ANNO REGNI XLVI, meaning "An ornament and a safeguard – [in the] 46th year of [her] reign". The 1994 pieces were never legal tender but were eventually released for sale as part of a presentation set in 1998. At the same time in 1994 the Royal Mint produced a mono-metallic trial two-pound coin, with the same ship reverse and inscription, but otherwise similar to the earlier commemorative coins. These were never issued in presentation sets, and so are much scarcer than the bi-metallic version. In February 2015, the Royal Mint announced a new design featuring Britannia by Antony Dufort replacing the previous design. The new coins will feature the edge inscription QUATUOR MARIA VINDICO, meaning "I will claim the four seas", an inscription previously featured on coins bearing the image of Britannia. The comparative rarity of the Maklouf-effigy coins has led to an urban myth that they are much more valuable than the other coins, but this is not true – there were over 13 million 1997-dated £2 coins issued. Another urban myth about the coin is that putting it in the freezer overnight causes the cupro-nickel centre to pop out, a claim which had been true of some early mintings of the similarly bimetallic Canadian 2 dollar coin. In addition to the standard designs there have been several variant reverse designs used on the £2 coin to commemorate important events. These are summarised in the table below. ^ A symbol of optimism BRITANNIA RETURNS Royal Mint (www.royalmint.com). Retrieved on 2015-03-01. 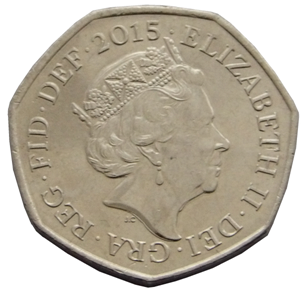 ^ "The Definitive 2015 United Kingdom £2 Brilliant Uncirculated Coin". Royal Mint. 2015. Retrieved 2015-03-02. ^ Thomas Snelling (1762). A View of the Silver Coin and Coinage of England, from the Norman Conquest to the Present Time: Consider'd with Regard to Type, Legend, Sorts, Rarity, Weight, Fineness and Value : with Copper Plates. T. Snelling. p. 34. ^ a b "The Royal Mint announces coins for 2014". Royal Mint. 6 January 2014. Retrieved 21 January 2014. ^ 800th Anniversary of the Magna Carta 2015 UK £2 BU Coin Royal Mint (www.royalmint.com). Retrieved on 2014-11-13. ^ The Royal Navy 2015 UK £2 Brilliant Uncirculated Coin Royal Mint (www.royalmint.com). Retrieved on 2014-11-13. ^ a b c The Shakespeare 2016 UK £2 Three-Coin BU Set Royal Mint (www.royalmint.com). Retrieved on 2015-11-03. ^ The Army 2016 UK £2 Brilliant Uncirculated Coin Royal Mint (www.royalmint.com). Retrieved on 2015-11-03. ^ Great Fire of London 2016 UK £2 Brilliant Uncirculated Coin Royal Mint (www.royalmint.com). Retrieved on 2015-11-03. ^  Coin Week (www.coinweek.com). Retrieved on 2018-03-16. ^ "Commemorative £2 coins struck to circulating standard, 1986-96". Royal Mint. 2008. Retrieved 2012-11-24. 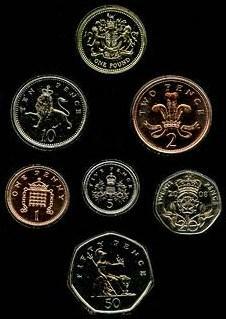 ^ a b United Kingdom decimal coins issued into general circulation, Royal Mint. Retrieved 2014-05-08.